Brain Chanceiversary 2: Another Rhapsody In Blue! So I think the ghost of George Gershwin is haunting me. I woke up this morning, April 10th, 2014, and realized it was my 2-year Brain Chanceiversary. This was the day, two years ago (TWO YEARS AGO!) that I had my first brain surgery, in Hong Kong. This was the day that it all started; the day that I began my ongoing Dance with Cancer. This is my cancer birthday. So I woke up this morning (hooray for that! ), and the first thing I did was turn on the radio, as I normally do. It was tuned to Classical KUSC (91.5), as it normally is. But here’s the weird part: the instant– the exact instant— that the speakers came to life, guess what I heard? I heard a clarinet. Like somebody had cued it up for me. Like it was the soundtrack to a movie. “No way,” I thought. This was a clarinet that I recognized. This was a clarinet you’d recognize too– it’s possibly the most recognizable clarinet ever recorded. So why was it so weird for me to hear it this morning, of all mornings, on my brain cancer birthday, at the exact instant that I got out of bed and turned on the radio? The same “Rhapsody In Blue” that I mentioned in this post back in September. 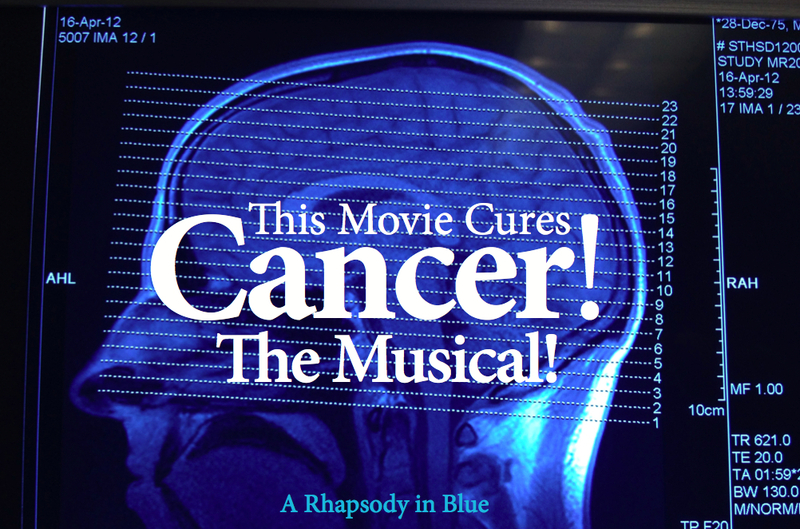 The same “Rhapsody In Blue” that was written by a guy who died at my hospital, at my age, of the same brain cancer that I have right now (George Gershwin, 38, GBM). I was just on a beautiful BBC radio program called “Soul Music” last week, talking about this very song, and what it means to me. 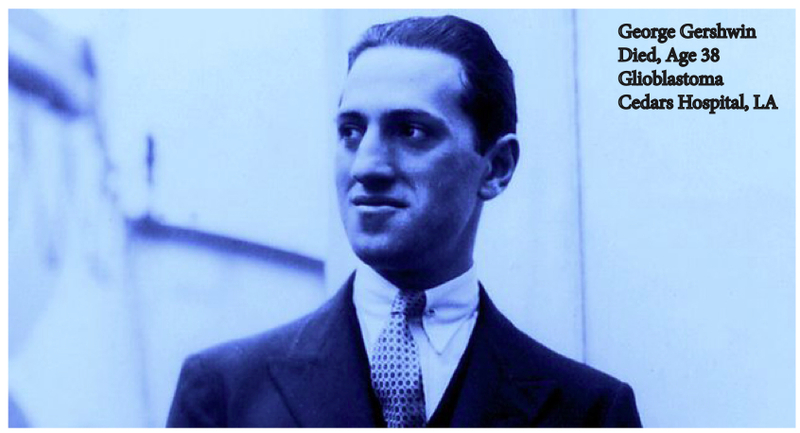 So either I’ve been following George Gershwin around for the last two years, or he’s been following me. Either way, I’m happy to have his company. And grateful that he came by to say Happy Brainchanceiversary. Sometimes I feel like I’m living a Rhapsody in Blue. I have to tell you that having listened to your programme last week, I was really glad for 2 reasons. I had never listened to a piece of music that could be interpreted in so many ways. and I really wanted to keep up to date with your progress. todays blog is certainly good news. I have prayed for you and will continue to do so. lets hold on to the results from mri scan in the hope you will return to LA. thank you for sharing your news with the world and will always remember you when I hear “your” tune, it is most uplifiting. God bless. Whoa, Chad! Two years?! Happy chanciversary! AND, not only did you get up, but you also are still functioning, blogging, reflecting on music and coincidences on BBC radio programmes, writing screenplays and making us all feel thankful. You are in the Durkin family’s prayers regularly, and now we will listen to Rhapsody with a fresh perspective. Thank you for sharing! Brain anniversaries are good. As a matter of fact, they are delightful. Especially when it is your chanciversary! We were there with you at the first surgery, there at the second and will be there with you and for you until our days are over. You’ve beaten the odds! We are proud of you and believe there is a reason for everything. You have become a better person, a better writer, a better friend, a better son. Keep going…we believe you can and will! Inspiring as usual. Loved listening to you and George Gershwin on BBC. I always look forward to your updates. I hope you are getting along ok and want you to know you are in my prayers. hi from North Carolina, Chad. I’m binge-reading your blog (steered here by The Everywhereist), and it was wonderful to hear your voice via this post. I like how your brain works – the depth and breadth and cul de sacs (culs de sac?) and odd tangents and the way you take the lens of cancer and use it to give yourself and us an even more vivid, magnified perception of this beautiful Life. Thank you.